Since the area of online marketing is still relatively new, there is a lot of room for thought leaders to come up with new concepts and coin new terms. For example, this is the case with the concepts of inbound marketing and content marketing; they are both relatively new terms. They made their way to the scene not that long ago. For example, Inbound Marketing was coined by Brian Halligan (Co-founder of Hubspot) in 2005. Terms like inbound marketing and content marketing have almost turned into buzzwords. However, these terms and the practices surrounding theme are here to stay. For a new term like inbound marketing to be coined only ten years ago, it has come a long way, and it has a long future. Inbound marketing is just an umbrella term that encompasses a variety of specific types of marketing techniques. Typically inbound marketing is dealing with different methods of online marketing that offers value. Inbound marketing consists of many different marketing techniques (typically online marketing). However, Inbound marketing is also a value-based mindset. When you look at the goal of inbound marketing, you realize it’s all about driving traffic and visitors to your website, blog, social networks, email list, etc. You then want to convert that traffic or those leads into paying customers or clients. The concept of inbound marking is founded on the idea of offering value for free. The only way people will seek you out is if you offer more value than your competitors. 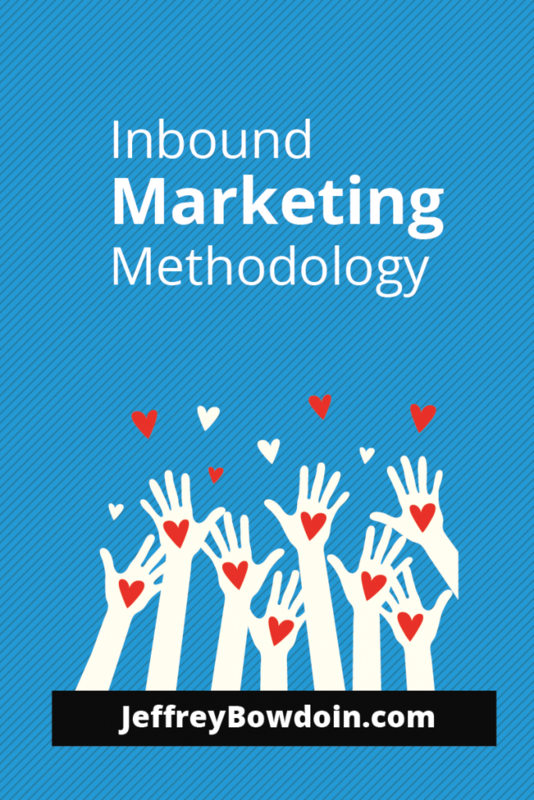 Therefore, inbound marketing is largely about having and behaving through a value-based approach. So beyond learning all the online marketing techniques, you should have a mindset that you will always try to add value to your audience. Inbound marketing: Inbound marketing is about offering value, in hopes of eventually making sales. Customers seek you out with this type of marketing. Outbound Marketing: Outbound Marketing typically involves interrupting people in an attempt to make sales. You seek customers out with this kind of marketing. content marketing – many other forms of content marketing. Attract: Add value and attract visitors to your website. Convert: Get people’s contact information to initiate the conversion process. Close: Use things like CRM and email to convert your audience into sales. Delight: Continue to make your customers happy. Attract: Attract an audience and traffic by creating value. You do this through various forms of content marketing, SEO, blogging, social media, etc. Captivate & Engage: You don’t want to attract just any traffic. You want to attract a high-quality audience. There is a big difference. You do this by captivating your audience and keeping them engaged. An engaged audience will be much more valuable than a passive audience. You want to focus on building a community rather than just traffic. Convert (e.g. Email capture): There are many conversions that you will track. One of the first conversions is usually to get contact info such as an email, phone number, etc. You can do this by offering a free ebook, have them sign up for a free trial, etc. These will allow you to foster relationships, which help transition to convert into a sale. Build Relationships: There are countless benefits to building relationships with you customers, so you should make that a central focus of your marketing campaigns. You want them to feel like they know like and trust you. Adding value is usually what fuels your relationships. Email is a great way to achieve this, but also just continually offering value and great content on your blog also achieve this. Convert (e.g. Sale): You need to convert on what makes your business money – whether that be product sales, services, etc. The smaller conversions of email capture, sign ups, etc. all contribute to your main conversion of sales. Continue Building Relationships: You need to keep that relationship intact. It’s difficult to build the relationship, but it’s infinitely harder to recover if you lose their trust or make them upset. Convert (e.g. Future Sales): You want to convert your customers over and over again. Keep adding value in products or services that contribute to increasing the customer lifetime value. Years ago when I was in high school, I had the thought that marketing needs a revolution. This idea came to me before YouTube existed and when Google was becoming more and more mainstream. I didn’t have any marketing training, nor was I necessarily interested in marketing at the time. Later on, I became much more interested in marketing, specifically online marketing. I saw the power in marketing SEO and other online marketing techniques to drive customers for any entrepreneurial venture. But I didn’t need any marketing training to understand that marketing needed a revolution. It was common sense to me; I was just sick and tired of seeing all these lame commercials, and I completely zoned them out. I just had the thought wow, I can’t believe all this money is going into all the stupid commercials that I see on TV. They just don’t work. I thought, this type of marketing might work for the older generations, but my generation is different. At least for me those type of advertisements don’t work. They just annoyed me. Unbeknownst to me, though, we were right in the middle of a marketing revolution. We were in a revolution of new and expanding social networks, a completely altered landscape of the online world, and many technological changes. All this technological change that we saw online lead the way for a revolution in marketing, business, and economics. The term inbound marketing is new. The term inbound marketing was largely popularized by HubSpot (Brian Halligan). However, the concept of inbound marketing is not new. According to Peter Drucker, inbound marketing been around for over a century. It probably goes back even further, but obviously without technology, like we have today, it was a pretty archaic form of inbound marketing. Though inbound marketing is a new concept, it has completely taken over the business landscape. Some outbound marketing techniques may still work and are often still used by larger companies however inbound marketing has been a disruptive force for almost every industry. I think the future of inbound marketing has a bright future. Who knows if the term inbound marketing will continue to stick, however, the concepts that it represents are here to stay. I believe that in many industries, companies that fail to implement inbound marketing strategies will fall by the wayside to their competition who does implement these strategies. Because of the evolving technology that consumers have, it makes it easier and easier for the cream to rise to the top naturally. The companies that offer the most value are going to be the ones in the forefront of their customer’s minds. I also think that because the future of advertising looks very bleak at this point, inbound marketing will continue to surge in popularity. All in One SEO Pack vs Yoast SEO – Which is the Best SEO Plugin in 2016?